The wildflowers are blooming away these days in the yard and every once in awhile a Ruby-throated Hummingbird puts on a show. They have not been seen often, but I did get a couple of shots yesterday of what I think is a juvenile on the Royal Catchfly. Images were taken on August 2, 2017. We still have Ruby-throated Hummingbirds hanging around the yard here in Waukesha County. The hummers have favored the Scarlet Sage and Zinna plants for the most part but often frequent the nectar feeders too. I was fortunate to get the opportunity to photograph a Ruby-throated Hummingbird on the nest feeding a chick and did not pass it up. Running into Anne Morretti out birding, she mentioned 2 of her birding friends Joann and Monica had an active bird nest. I followed the excitement of the event for a couple of weeks from the first moment of seeing a nest with a female sitting on it, the tiny beak from the chick above the nest, till the day the bird fledged. There was just one chick and the female was always hanging around of course. Once in awhile a male was seen, but I never saw it near the nest. To find a Ruby-throated Hummingbird nest, you just have to be in the right place at the right time when an adult goes to the nest, and they were. The nests are just so tiny! A big thank you to Monica, Joann and Anne for sharing this event. A difficult event to photograph as lighting changed by the second, up in a dark tree and the branches were always moving so I apologize for any poor quality images as some I thought should be included in this post. I have put the images in order as the way they happened. Images were taken from August 22, 2016 thru September 4, 2016. At this point, not even sure if there is a chick in the nest or an egg, is she just house cleaning? She sits on the nest, and out comes a feather, still don’t know if the feather was laying in the nest from her earlier or is off a chick? Then the moment, a beak is seen poking up from the nest, it is a chick! The chick is growing fast, there is the female on the branch along with the chick in the nest, calling “Mom”! I will be back soon, chick in the background “Mom”! Just about time to fly, the chick fledged on September 4, 2016 about 9:00 am. I hope they are all doing well! A pair of Ruby-throated Hummingbirds have been hanging around the yard here this summer in Waukesha County. We have seen very little of them all summer but in just the last couple of days they have been hitting the Royal Catchfly, one of the many plants they get nectar from here in the yard. The male is seen less and I am still hoping for some shots of that beauty. I took a few minutes today to photograph the adult female in action. Images were taken on July 31, 2016. With not much going on bird wise, I decided to make a run out to Wyalusing State Park to see what was going on. Bruce joined me for the day and we had a great time. Some of the species seen in the park were Cerulean Warbler, a life bird for me, Yellow-billed Cuckoos, Dickcissels, Scarlet Tanager, Blue Indigo Buntings, American Bald Eagles, and very many Baltimore Orioles to name a few. The highlight of the day were the 30-40 Ruby-throated Hummingbirds at the 4 feeders at once at the visitor center at the park entrance. I have never seen more than a couple of Ruby-throated Hummingbirds at once so seeing 30-40 at once was an amazing treat. One of the staff had noted that hummingbirds were recently banded and they had 4 birds that had returned from the previous year, how exciting! For the most park a cloudy day, the sun showed for a few minutes with nice mild temps. Images were taken on June 16, 2016. At least 2 Ruby-throated Hummingbirds are still hanging around the yard here in Waukesha County. Bottle Gentian has been a favorite once again as it is in full bloom now. Still amazes me how their bill goes into the top, then inside so carefully for the nectar and the plant almost looks untouched. With Cardinal Flower and Zinnias still blooming those are also still flowers of choice. They are still going to the nectar feeders along with other wildflowers in the yard. Images were taken on September 5, 2015. A pair of Ruby-throated Hummingbirds are still hanging around the yard here in Waukesha County. One of the plants they really enjoy is the Scarlet Sage. The stunning scarlet color and great nectar source make this plant a real hummer favorite. I took a few minutes today to photograph this adult female on a couple of the plants in action. Images were taken on August 30, 2015. Ruby-throated Hummingbirds have been hanging around the yard this summer and the Cardinal Flower is always a favorite for them. Today I took a few pictures to share some of the excitement. This bird is a female, correct me if I am wrong. Images were taken on August 9, 2015 in Waukesha County. A pair of Ruby-throated Hummingbirds have been in the yard here since spring. I photographed this female early this afternoon in a bed of Red Bee Balm. This plant is a magnet for these birds. Images were taken on July 5, 2015. The Ruby-throated Hummingbirds have been visiting the Bottle Gentian plants here. It is amazing how they go for the nectar in these wildflowers. In some situations they probe into the side of the blooms with their bill. At other times they go in from the top with their bill. In my observations, if one method is not possible, they go the other method. They have entered both ways on the bloom clusters weather the blooms are on the inside or outside in the cluster. We have had 3 Rudy-throated Hummingbirds, female, male and a young male, all 3 have hit these Bottle Gentian, Gentiana andrewsii plants. Images were taken in Waukesha Wisconsin September 6-10, 2014. Notes: A list of just some of the of native wildflowers we have planted in our yard to attract these exquisite tiny birds are: Red Bee Balm (Monarda didyma), Wild Bergamot (Monarda fistulosa), Cardinal Flower (Lobelia cardinalis), Wild Columbine (Aquilegia canadensis), Royal Catchfly (Silene regia), Bottle Gentian (Gentiana andrewsii), Butterfly Milkweed (Ascelpias tuberose), Hoary Vervain (Verbena stricta), Nodding Onion (Allium cernuum), Penstemon species, Echinacea species. Some recent images taken in Waukesha Wisconsin of the Ruby-throated Hummingbirds on various plants. Images show a young male and adult female on the flower species Cardinal Flower, Yellow Giant Hyssop and Zinnia’s. Images were taken August 24 through September 4, 2014. Ruby-throated Hummingbird, young male on Zinnia species with flying nectar! Something I have never witnessed before was the Ruby-throated Hummingbird stopping for some nectar at this rare wildflower, Smooth Phlox, Phlox glaberrima interior. It was only a few seconds, but a beautiful moment at that. I assume this bird is a female adult. Photographs were taken on July 25, 2014. I had the opportunity again to photograph the Ruby-throated Hummingbird enjoying Royal Catchfly (Silene regia). Present today was a female, male and young male, they only showed up one at a time. This fascinating species favor red tubular flowers most of all. Royal Catchfly, a native of Missouri, is an excellent candidate here. Photographs taken on July 23, 2014 in Waukesha County, Wisconsin. I did some birding at Lakeshore State Park in Milwaukee this morning. The highlight was a young male Ruby-throated Hummingbird working some native plants there. The Green Heron was also present along with the common Ring-billed and Herring Gulls. Beautiful day to be out birding with mild temps, sunshine and lows winds. Ruby-throated Hummingbird on Penstemon spp. Leucistic Ruby-throated Hummingbird photographed in Waukesha County on September, 18 2013. Leucism is an uncommon condition in birds. This condition is caused by a genetic mutation which prevents pigments, particularly melanin, from being deposited evenly in the bird’s feathers. Leucistic birds have melanin elsewhere in their bodies which is why they may have dark eyes, legs, and bills. However, their true color will be missing or greatly reduced due to the lack of proper pigmentation. Leucism is similar to albinism as in both cases the birds may be completely white. However, albinism is defined as a complete absence of melanin in an animal. Truly albino species will have pink eyes as the only color seen will be caused by blood vessels behind their eyes. They will also have pink bills, legs, and feet. Albinism is extremely rare in birds. Leucistic birds are extremely uncommon for a number of reasons. They are not thought to live very long because their white feathers make it difficult for them to hide from predators. If they do stay alive, it is difficult for them to find a mate and successfully pass on their genetic mutation. Additionally, the melanin found in regular birds adds strength to the feathers. Leucistic birds lacking melanin have weaker feathers and thus have a more difficult time flying in severe weather. Last, the reflective properties of white feathers may be problematic for birds who rely on solar energy for heat. To see Ruby-throated Hummingbirds without Leucism, please visit my posts featuring this bird on Red Bee Balm, Royal Catchfly and Cardinal Flower. Ruby-throated Hummingbird on Cardinal Flower photos taken August 26th, 2013 in Waukesha County, WI. I had another opportunity to photograph the Ruby-throated Hummingbird in my backyard, this time enjoying Royal Catchfly (Silene regia). As I mentioned in my last post on this fascinating species (Ruby-throated Hummingbird on Bee Balm), these hummingbirds favor red tubular flowers most of all. Royal Catchfly, a native of Missouri, is an excellent candidate here. Photographs taken July 21, 2013 in Waukesha County, WI. Just this week, I had the chance to photograph a Ruby-throated Hummingbird on Bee Balm at length in our yard in Waukesha, WI. 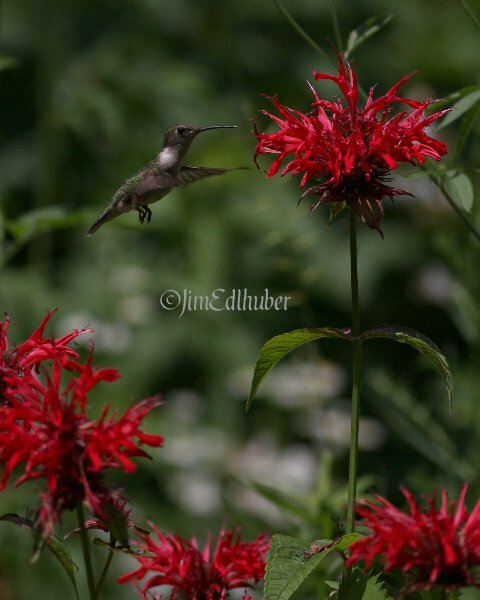 The action I captured was of the Ruby-throated Hummingbird repeatedly visiting a bed of Red Bee Balm in our yard. This solitary species is enjoyable to watch as it darts, hovers, rotates, perches, and flies both forwards and backwards (Hummingbirds are the only bird species currently known to fly backwards). They favor red tubular flowers for nectar as is demonstrated by the vibrant Red Bee Balm pictured (Monarda didyma). Pictures taken on July 15, 2013 in Waukesha County.